Despite my grand promise to keep this puppy under control, I’m faced with another swathe of time to account for. Too much fun being had by all, especially around the web 2.0 read\\write future. So, herewith the catch up. Supporting more than 60 galleries, and at more than twice the size of its inaugural event in 2005, it brought together galleries from all over New Zealand and Australia, creating a showcase of the best contemporary art in the Antipodes. Sunday was the last afternoon – and it was still pulling the crowds since the Thursday night opening. In short, a stunning success for the organizers, and a great endorsement of the idea of a New Zealand version of the international trend: offer real live people access to real live contemporary art , and, gosh – gasp, wait for it: actually ask them to think about buying some! The venue also helped – the Viaduct harbor was at its late summer best – warm – sunny, and a great backdrop to the art. Among the hundreds of works, there were two of my total favorite artists on show – a set of works on paper from Shane Cotton from Hamish McKay Gallery, and a brilliant Michael Height, from Milford Galleries. Shane Cotton is turning into the most watch able of New Zealand’s contemporary artists. 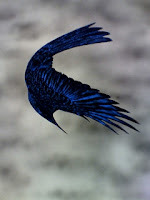 His latest series - deep blue backgrounds with fantail birds in flight within a complex Maori narrative frame: well – just let’s say you have to see them to feel the power. One of the big guys is still on view at the Auckland Art Gallery. There are also some images at the Gow Langsford Gallery. There was also a brilliant big Michael Height from the Milford Gallery in Dunedin. I adore his stuff, and one of these days, there is going to be one of his hanging in our Auckland apartment – end of story! But most of the weekend was spent in Wellington. 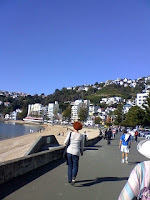 I even managed a swim and a walk along Oriental parade on a beautiful, to die for Wellington Saturday afternoon. It’s true. Wellington on a good day – well – I shouldn't say this too loudly, because it only encourages them, but it is truly one of the cutest cities on the planet. I just wish you could say it out loud without feeling like I’ve sat an exam. Speaking of tests and awards – Friday night had a few nervous faces waiting for the swish of the envelope and the winning announcement to the Qantas Media Awards. Now in their 34th year, they started as an awards recognizing excellence in news photography and have developed to include recognition of what is the best in virtually all journalistic disciplines in New Zealand. In short, New Zealand’s premier journalism awards, and definitely the industry night out, complete with diner jackets, and flying buns. This gives the winner the chance to go and do some serous thinking on a project or theme of their choice in Cambridge, UK. However, in a break from tradition this was also the year the Awards introduced some internet categories. Note the syntax – not an internet award which was put in some kind of silo at the top of the running order, but good old fashioned parallel billing in the running order. And yes, for the record, I was one of the judges, and made a speech which people seemed to like, including the blog category winner, Russell Brown at Hard News. Speaking of which: this was a stand out local blogshere winner. Hard News is not only a national benchmark to good blogging practice, it has a welcome international reach which is essential for the craft. Moreoever, despite others offering their own personality, it has a quality as rare as haggis eggs, [my own intermittent efforts included] and that's depth and regularity. Anyone in this business knows it’s possible to pull of the odd opinion and wrap it in a reasonable set of words. What’s difficult is to be regular, consistent, week in week out. In short a voice and personality in sync with old school journo virtues like checking sources, getting the facts right, and asking the right questions, especially of yourself. Hard News has all that - hence its deserved win. It was also really good to see Radio New Zealand pull of the best design award. Lastly, although they didn’t win their category, Scoop are hopefully quietly happy with the result. Because, think about it guys – after a few short years you are up there beside the big media compnaies in the likes of NZ Herald and Stuff. [Aka Dominion, et al]. This is a serious achievement – and one which I’ll return to when I finally get round to a retrospective account of the second Deep Dive in LA, from IBM. As for Qantas, and the equally stalwart organizers Barry and Carolyn Young, I hear provisional plans are already in play grow the internet categories – e.g. give the blogging the chance to expand. They have also high hopes to repeat the success of the Wolfson Scholarship by offering a parallel online fellowship to the likes of MIT or the Oxford Internet Institute. I’m totally in support of this idea. 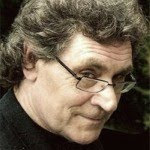 Think about – we give our best online practitioners that precious quality of all – some space, time and a bit of money to do some thinking about the future, and how we construct it? It wouldn’t take a lot of resource, but to get to it we need partners, and sponsors. Ideas and suggestions welcome – but if you get a cold call from me trying to drum up support for this, then don’t say you haven’t been warned. And last – but not least, in case it had slipped your memory, Thursday is the start of the Auckland Writers Festival. See you there! I agree re: Hard News. It is a standout. Christchurch City Libraries will be blogging from the Christchurch City Libraries blog.